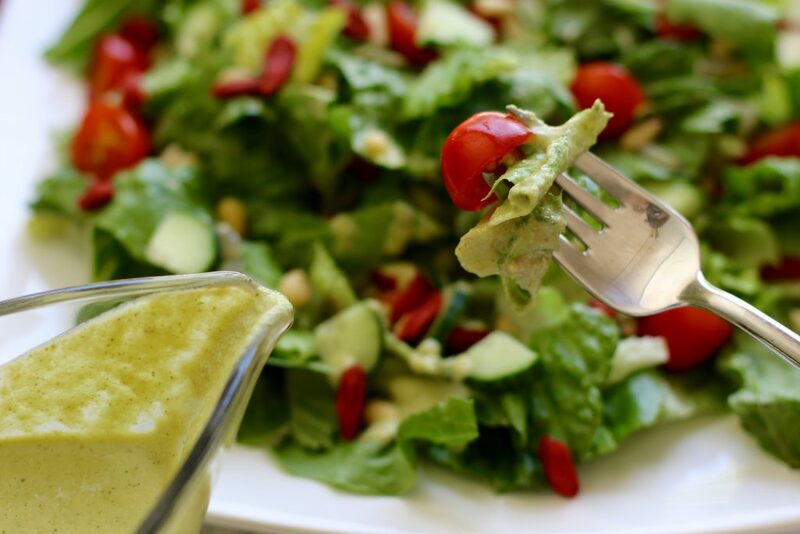 Looking to make a healthy dressing that tastes great? 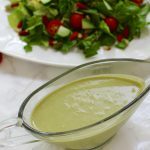 Loaded with immune boosting properties, this dressing is filled with raw ingredients that are sure to provide you with several nutrients needed to keep you healthy all served in one bowl. I had one of those weekends where I planned to attend my son’s soccer game and then next thing you know, I am on the red carpet at the Soho International Film Festival. 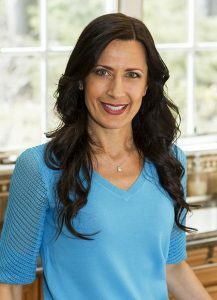 I spent a beautiful Saturday with my amazing friend/actress/mom/runner, Stacey Van Gorder. It was quit the change of pace from my daily routine! 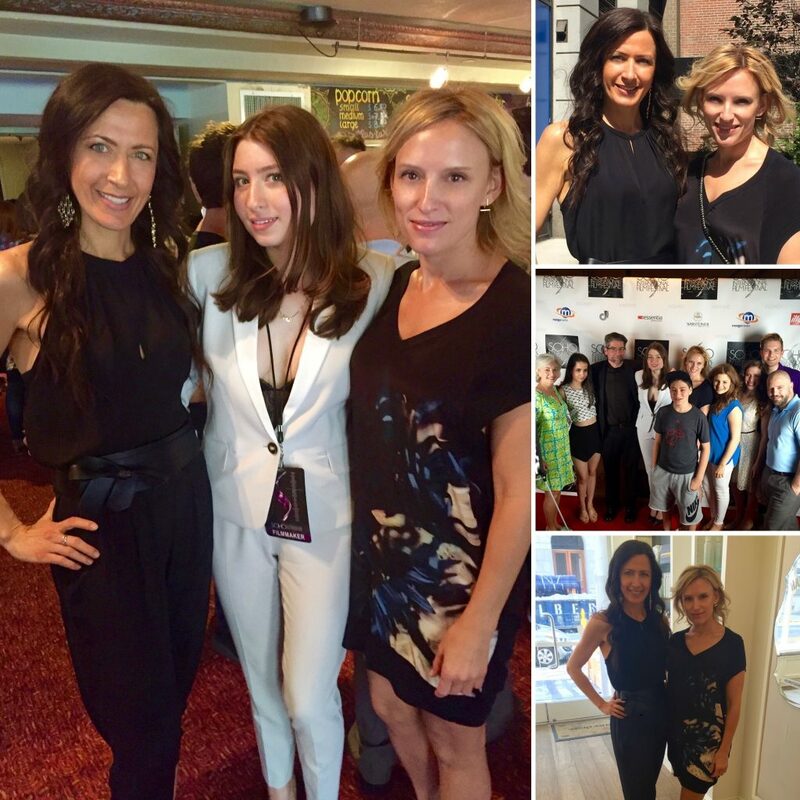 Samantha Brooks, Mel Brooks’s Granddaughter, did a fantastic job on her first film, Confession on Pleasant Street. I couldn’t believe she was only 16 years old when she shot the film! What a nice family! Being entertained by some interesting shorts was a perfect way to spend the day. Lemons – high in vitamin C which helps strengthen the immune system. Ginger – gingerols and shogaols are the major pungent compounds present in the rhizomes of ginger which stimulates blood circulation and opens your sinuses. A few medicinal properties of ginger include the alleviation of nausea and arthritis pain. Onions – contain allicin which slows down and kills a variety of viruses and bacteria. Consuming onions raw will aid in the prevention of sicknesses. Garlic – acts like a natural antibiotic and an excellent way to fight off illnesses. Apple cider vinegar (unfiltered) – considered prebiotic which is beneficial for keeping the digestive system healthy. Hemp – a great source of omega- 3 fatty acids that are essential for reducing inflammation. The added bonus to all these amazing ingredients is that the dressing actually tastes fantastic! The cashews make a wonderful substitute for the creamy consistency. Cilantro has a distinct taste but combined with the bold flavours of ginger, apple cider vinegar, lemon and the added sweetness of the medjool date makes an excellent combination. 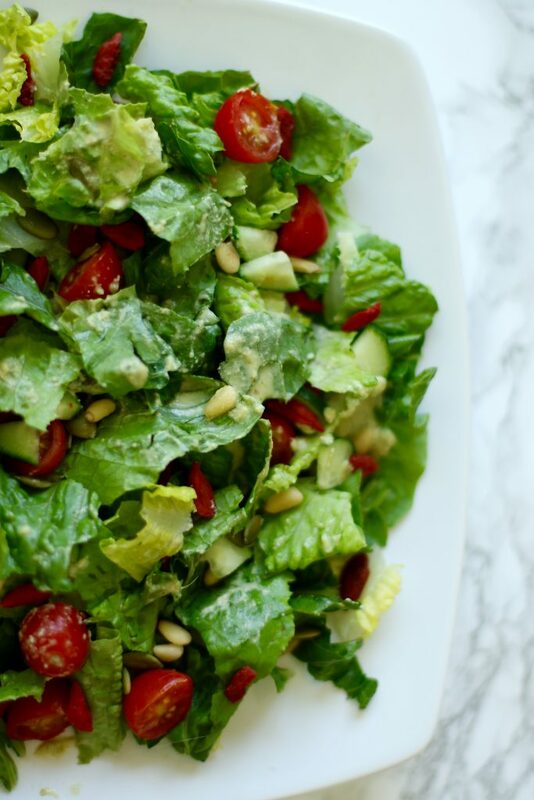 You have to try this dressing on your next salad! 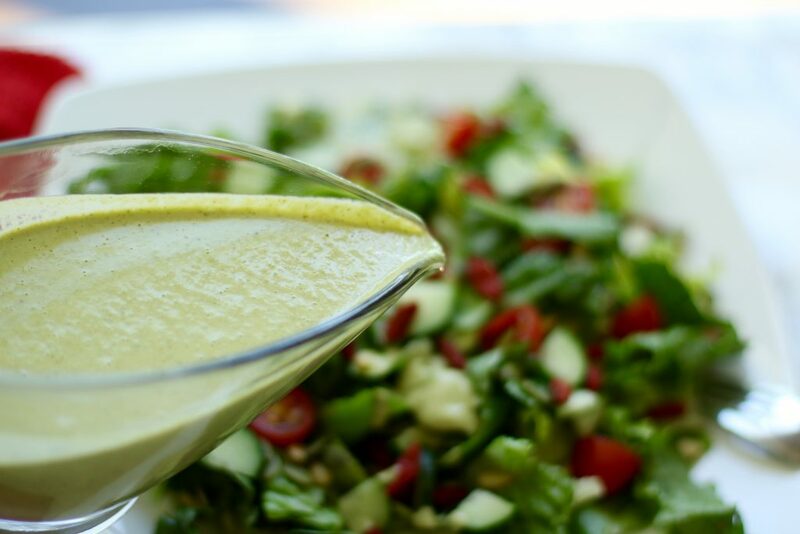 Exploding with flavour, this dressing works well with any salad. The ingredients are sure to boost your immunity and keep you healthy and strong during any season. 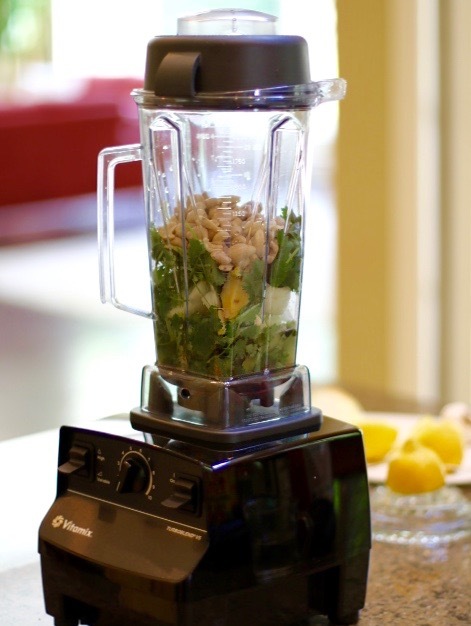 Place all the ingredients in the Vitamix and combine until smooth. 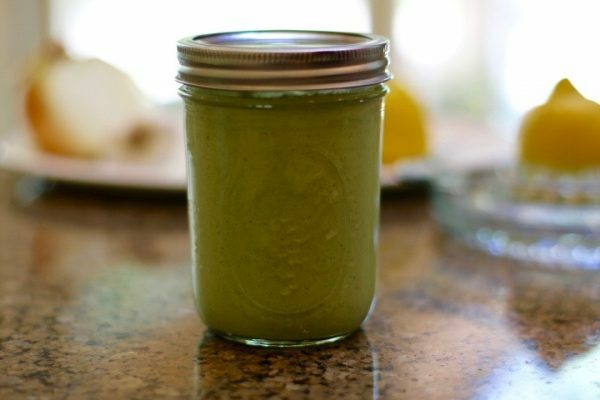 Extra dressing can be frozen in a canning jar and taken out the night before. 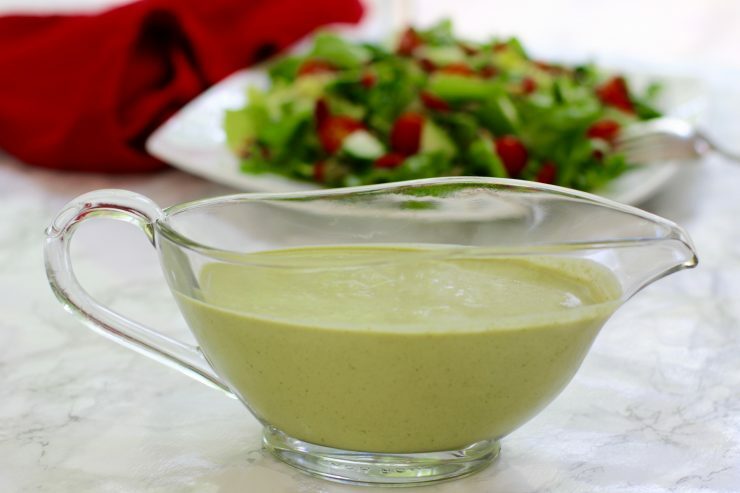 Dressing should last about a week in the refrigerator. Great suggestion for a refreshing “zing” on a cold summer salad. Love the ingredients! Using cashews is pretty cool!! My mother just copied the recipe!! Thank you! So glad to hear it. So happy to hear you will try it! You’re welcome. I think I need a Vitamix blender. The salad came out wonderfully! I can’t wait to try it. Thank you so much. Glad to hear you will try it! I love all Mel brooks movies. All of them and I am so jealous! We had an extra ticket! Thank you so much! I am so glad you like it. Young Frankenstein—written and directed by Mel Brooks. So good. I’ll attempt to make this delicious salad and re watch it!!! Great movie! I’m so happy you will try the recipe. The salad looks so good!!! Do you think the dressing would work well as a sauce for chicken and/or steak? Thanks!! This dressing works well on anything. I sometimes put it on my rice. I love the option of freezing a jar for another day. What a Wonderful post. I love being able to freeze this dressing so I can make batches of it. Thanks! I love salmon and have been looking for a new marinade to put over it, especially something light and refreshing during these hot summer days. You have truly inspired me with this recipe. I found a winner!! Thank you! Thank you so much!! Yes salmon and this dressing is delicious.